The next morning we woke up refreshed, rested and excited to get our day started! 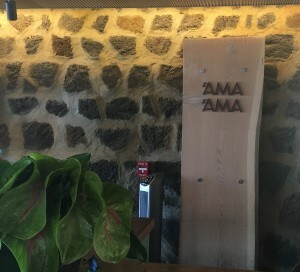 We had brunch at ‘Ama ‘Ama, the beachside signature restaurant at the resort. 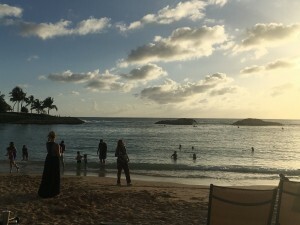 The view once again was amazing as we looked out over Aulani’s pristine beach. 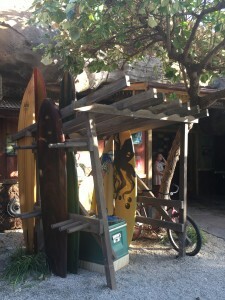 The food at ‘Ama ‘Ama is sort of “Americanized” Hawaiian food. Josh and I are both adventurous eaters, so we were pleased to see some local looking entrees and ingredients, though they were available more so for dinner than breakfast. 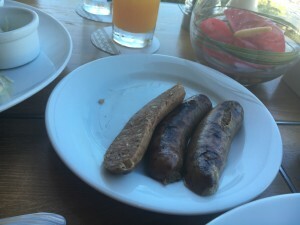 Josh ordered a delicious stack of macadamia nut (gluten free) pancakes with a side of sausages. 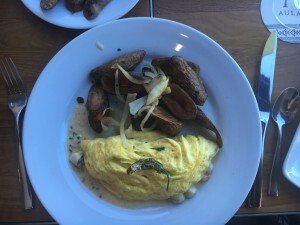 I ordered the seafood omelette with a side of Aulani potatoes. The omelette consisted of 3 eggs, scallops, shrimp, and cod. It was awesome. 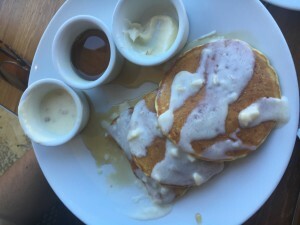 Josh’s pancakes also came with this amazing macadamia nut syrup. 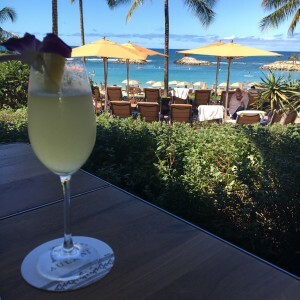 And don’t forget my pineapple mimosa. Heaven! I was also happily met with hearty “Yes” to my request for a small taste of the Belgian waffle. I knew I wanted the omelette, but really just wanted to try the waffle for good measure. 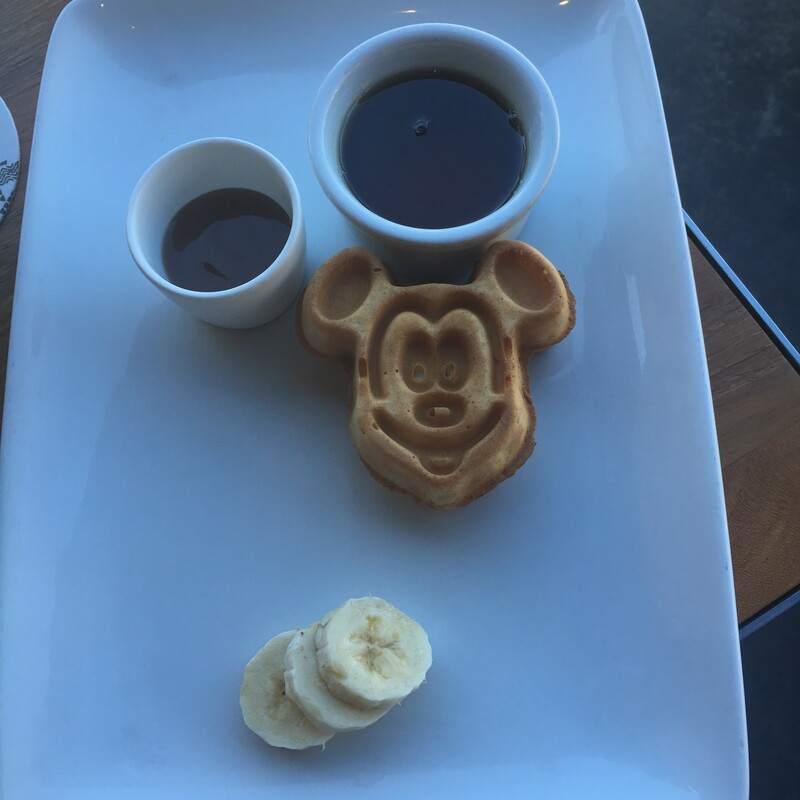 So the wait staff brought me the cutest little Mickey waffle I’ve ever seen. It was super yummy and was exemplary of Disney service. I loved it! After brunch, we had about an hour to kill before our appointment at Laniwai, so we decided to see if we could just go to the spa early. 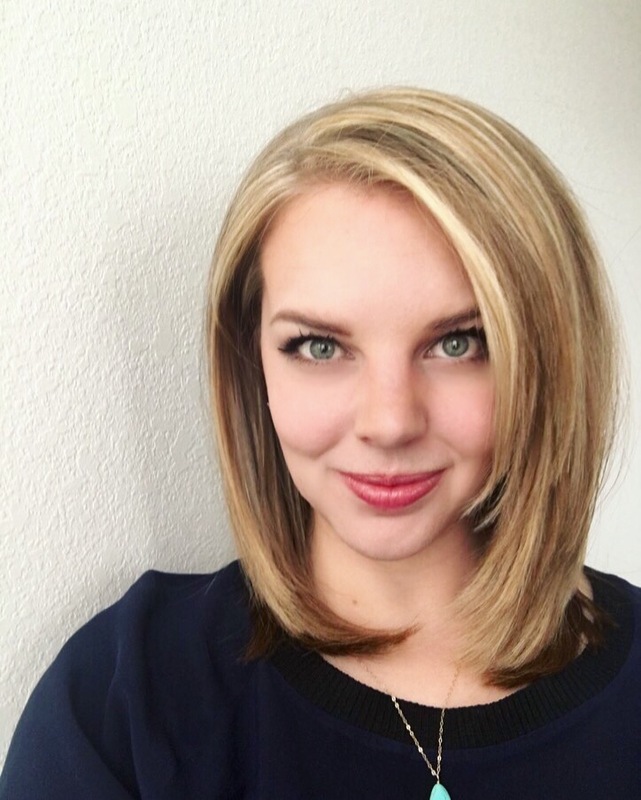 Let me tell you – this was a great decision. 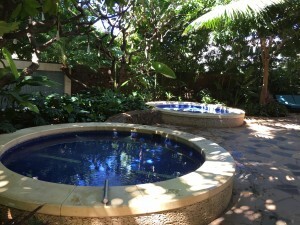 Laniwai spa is not only a full service spa, but it holds Kula Wai, the only hydrotherapy garden in Hawaii, and guests of the spa have full access to it. 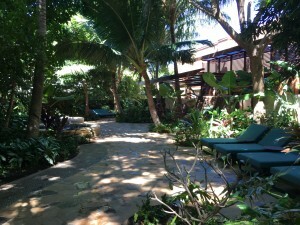 So this meant Josh and I had an entire extra hour to relax and chill out in this totally amazing garden filled with soaking baths, hot tubs, pressure showers, steam room, sauna, and even a cold plunge! This part may have been even better than the massage. 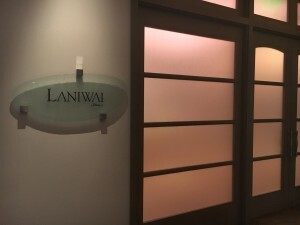 We were at Laniwai a total of about 4 hours (massage included). 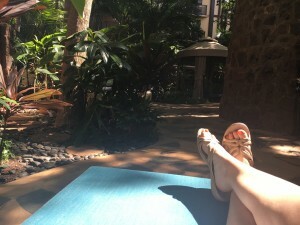 The staff allows guests to stay as long as they like before and after your spa service, so take my advice, Number 1 : Go to Laniwai; and Number 2: Get there early to take advantage of Kula Wai! 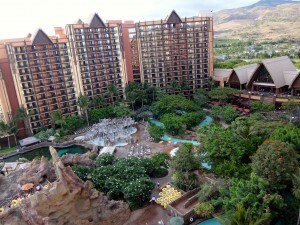 It really set the experience apart and was once again a testament to not only Disney service, but to Aulani service. 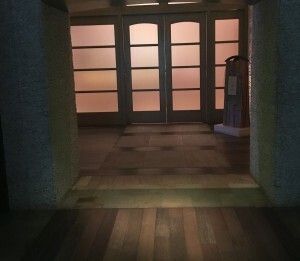 The spa itself was a dream. 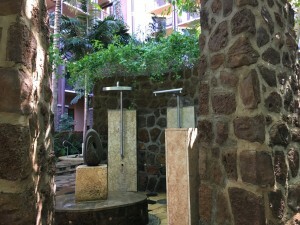 We opted for the Honi Honi Couples’ massage, which was both relaxing and refreshing. When it was time for our massage appointment, our therapists ushered us in from a communal relaxation room into our private room with two massage beds. We each were able to pick out one of six signature scents as body butter that our therapists then used during the massage. I picked plumeria and Josh picked mango, both of which were “blind” choices, meaning we only chose by smell without knowing the actual scent. After our massage we hopped back into the soaking baths for about half an hour before wrapping up our day at the spa. 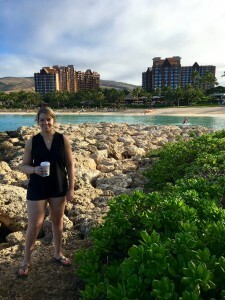 Laniwai was an awesome way to finish off our little one-night stay at Aulani. 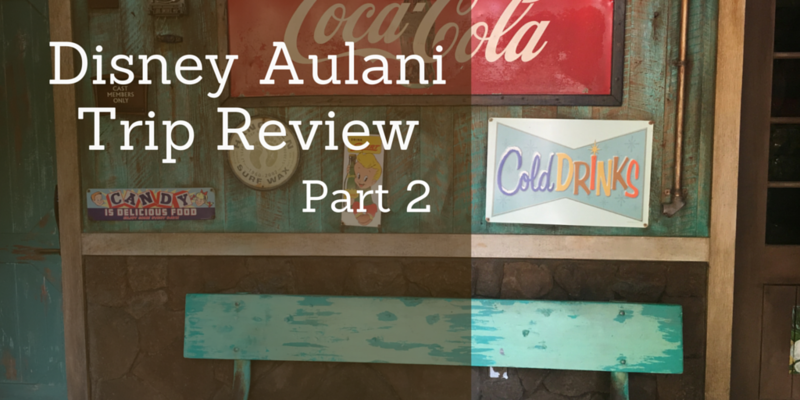 I definitely felt like we got a full experience of Aulani, at least as full as we could possibly do in just one day. 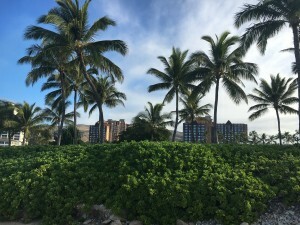 There were some experiences we missed out on, such as the Starlit Hui night time show and other day excursions, but we went into our trip knowing that we had lots of other Hawaiian style excursions planned on our own. 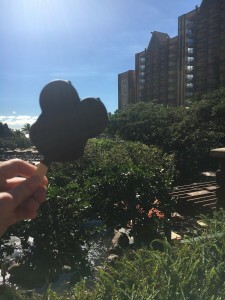 I do wish we would have tried out Makahiki, especially for the character buffet breakfast, but let’s just chalk that up to a reason to go back! I 100% recommend visiting Aulani. 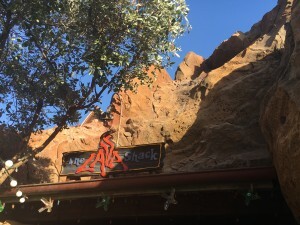 I felt a little bit of the Disney magic, particularly in the level of service and attention to detail, but it certainly has a different feel than one of the “mainland” resorts in California or Orlando. 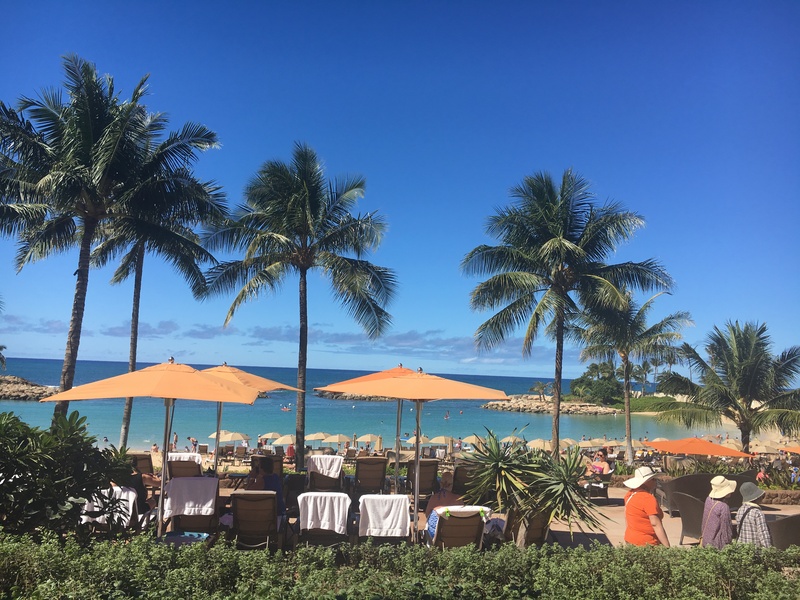 Don’t go into Aulani expecting to have the same type of vacation you would if you were going to one of the Disney parks, however. It’s amazing for kids and young families, but we had a blast just the two of us as well. 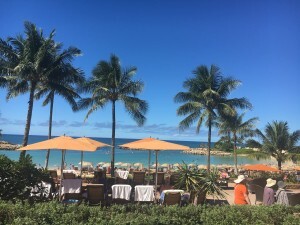 The food is great, the hotel amenities are totally on par with a Disney deluxe resort, the service is above and beyond even my highest expectations of Disney service, and you can’t beat the awesome backdrop of Ko’ Olina and Hawaii to spend some time with family, friends, and loved ones.